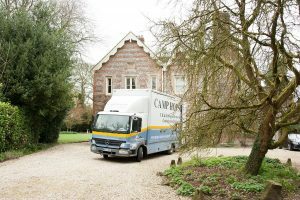 No one knows removals in Theale like Camp Hopson. Because we’ve been doing them for seven decades, we’ve worked out all the best ways of moving people efficiently and in a streamlined way that diminished stress and worry. Forget the incompetence you may have encountered elsewhere – we’ll plan your move and then execute it accordingly, and we can help with all the packing and unpacking, too, so that you’re relaxed from the moment you set foot in your new home. Our experienced packers have been thoroughly trained; valuables, specialist items, furniture and pianos, they know how to package and transport all of them and more. We’ll have the right protective packaging for artworks and we’ll take care on the way in and out not to damage carpets, walls and banisters. We’re a BAR-certified (British Association of Removers) establishment which means we bring you certain protections and standards. We also know Theale inside and out, so you’re not at the whims of a company that’s never been there before. Our drivers know the routes and they’ll get you and your possessions to the right place at the right time. Moving no longer has to be a soul-destroying slog; with us, all you have to do is show up and let us do the rest. We love what we do, so on moving day there’ll be no perfunctory performance, going through the motions or shrugging of shoulders. Storage in Theale hasn’t always been plentiful; our facilities are excellent and can come in extremely useful if you’ve got more stuff than space to store it. Downsizers often need time to work out what to do with excess belongings. Our storage units work for all requirements – from vast quantities of furniture all the way down to just a handful of miscellaneous possessions, it matters not how much storage you need; we cater to both large and small as well as short- and long-term.